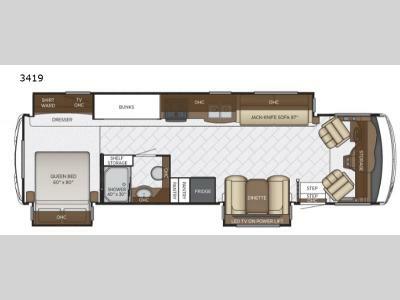 Come see just how convenient it is to camp and travel with this triple slide out Bay Star 3419 class A motor home! Your kids will enjoy their own space with the rear bunk beds and mom and dad can have the rear private bedroom with the queen bed. The spacious bathroom has a 40" x 30" shower plus there is a sink, toilet, and overhead cabinets for your toiletries. In the living area enjoy watching TV at the power lift TV while relaxing at the 87" jack knife sofa or at the booth dinette!